Royal Far West (RFW) made a submission to the Senate Committee Inquiry into Accessibility and quality of mental health services in rural and remote Australia. In an environment where new data has revealed Australia is behind other countries, the National Mental Health Commission has called for more investment in mental health for children from birth to 12 years. 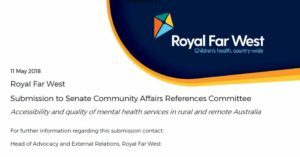 This period of childhood for rural and remote children and families is Royal Far West’s core focus for developmental health. * There are not sufficient mental health services in rural and remote parts of Australia and it is the responsibility of all governments to urgently address this. The COAG Health Council should be tasked to develop a rural mental health strategy, informed by a collation prepared by the National Mental Health Commission of the PHN service mapping in rural and remote areas and other key data that identifies service shortfalls. The Commission should also be tasked with monitoring and overseeing implementation of the strategy, reporting back directly to the COAG Health Council. intervention, particularly speech pathology and occupational therapy via telehealth for people living in Modified Monash Model 4-7 locations. d. Increasing MBS rebate for paediatric diagnostic services in Modified Monash Model 4-7 locations. mental health and conduct disorders, and address rural mental health as a national priority. RFW also contributed to the National Rural Health Alliance’s submission. * A range of multi-disciplinary early intervention service models (that can be delivered via a mix of face to face and telehealth) – to address issues presenting children prior to a mental health concern arising.